The Gröschel group is part of the Center for Nanointegration Duisburg-Essen (CENIDE), the Mateirals Chain (MC), and its laboratories are located in the research facility Nano Energy Technic Center (NETZ). The group develops materials with potential applications in energy conversion and with exceptional mechanical properties. Although there are various methods for mesoporous carbons, one of the challenges that remains, is gaining control over pore diameter and hierarchical porosity, while maintaining a low ecological impact at the same time. New concepts are required to enhance scalability, while reducing cost and resources for „green” processes and materials. To meet the demands of high interfacial area and tunable geometries, we design special morphologies from ABC triblock terpolymers and utilize nanocelluloses as sources for mesoporous carbon preferably in combination with catalytically active nanoparticles. We also design interface with strong adhesion with the aim to create strong, stiff and tough biomimetic nanocomposites with overall exceptional mechanical properties. Figure 1. Nacre mimetic nanocomposite. Aligning nanoplatelets into macroscopic samples allow mechanical 3-point bending tests to measure strength, toughness and first fracture toughness tests. In this project, we investigated–for the first time–the fracture properties of bulk NANOcomposites with highly aligned 2D clay platelets as reinforcements at high volume fraction. Knowledge of these mechanics is an important step towards understanding mechanical properties under bending or compression. We fabricated bulk nacre mimetic nanocomposites of considerable thickness (millimeters) by laminating and compressing nacre mimetic thin sheets (micrometers) of poly(vinyl alcohol) coated clay nanosheets (one nanometer thickness). The resulting material is highly aligned on multiple length scales (from nanometer to millimeter) governed by the combination of self-assembly and lamination processes. The mechanical stability of the laminate is almost identical to that of the single thin sheets. However, unlike the single thin sheet, the laminate tolerates exposure to humid environments for several weeks without sacrificing mechanical properties, which offers interesting applications as structural material (after modifications). This behavior is unexpected given that all components are water-soluble/dispersible and the fabrication process is water-based. We also took the opportunity to perform the first fracture toughness tests on dry specimens to follow crack propagation and identify failure modes. In a follow-up work Tuukka Verho analyzed the fracture properties in more detail with laser speckle imaging. Figure 2. ABC core-shell-corona cylinder micelle with cross-linked shell B and iron-filled core A. Block copolymers form very defined nanostructures in bulk and solution with precise geometry of the domains and a size of 10-100 nm. In bulk, competing interactions of the blocks will direct their orientation so that specific symmetries are created spontaneously. 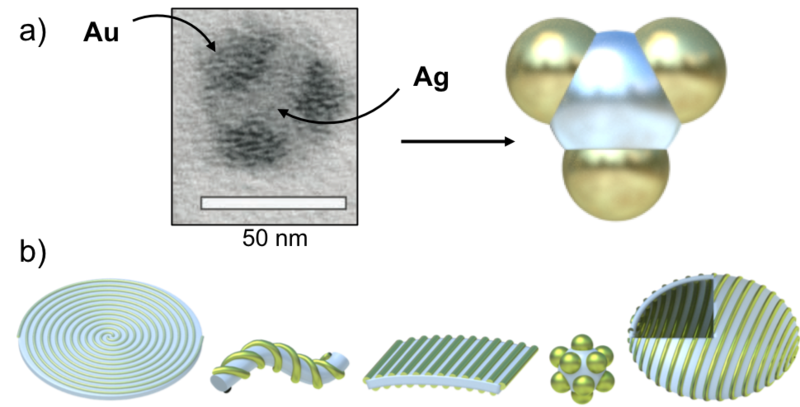 These nanostructures inspire templating of inorganic materials. As soft matter block copolymers develop curved interfaces they allow to direct the growth of inorganic nanostructures with unusual shapes and forms. 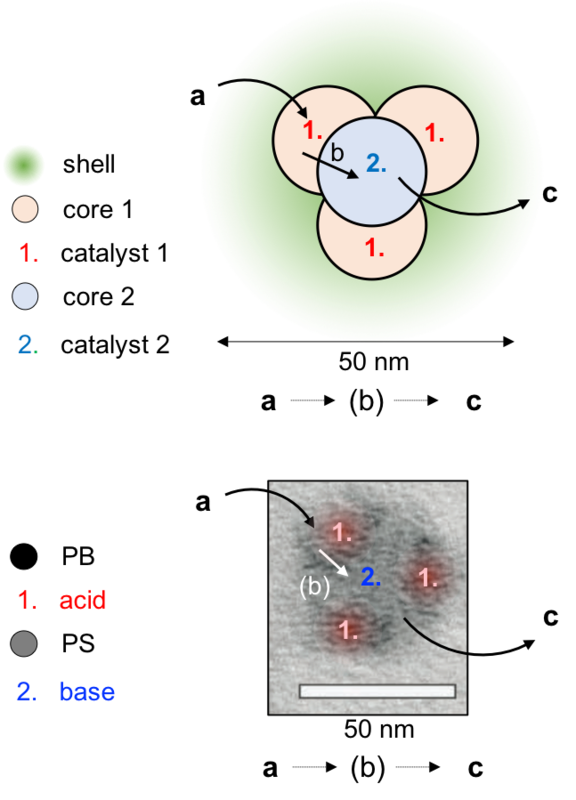 While AB diblock copolymers have already demonstrated capabilities that go beyond spheres, cylinders, gyroid and lamellae, ABC triblock terpoylmers feature a much more complex interplay of interfacial energies between AB, AC and BC, and thus provide a considerably widened spectrum of potential morphologies. Most of the complex morphologies were already identified by Reimund Stadler who pioneered this field. An overview of these terpolymer morphologies in summarized in a famous article by Bates & Fredrickson. Since then many more morphologies emerged. In running projects, we explore the bulk phase diagram of ABC triblock terpolymers with functional blocks that can be utilized as geometrically precise scaffolds for mineralization. This way it will be possible to generate bimetallic nanostructures with unprecedented compositions and shapes. In several new and running projects, we explore applications for this fascination class of potentially multifunctional materials related to mineralization and catalysis. One direction is the selective mineralization of metals/metal oxides within the compartments of terpolymer nanostructures in bulk and solution creating multimetallic replicas with complex shape and interplay. In a very similar manner, ABC triblock terpolymers can also be assembled into well-defined multicompartment micelles. 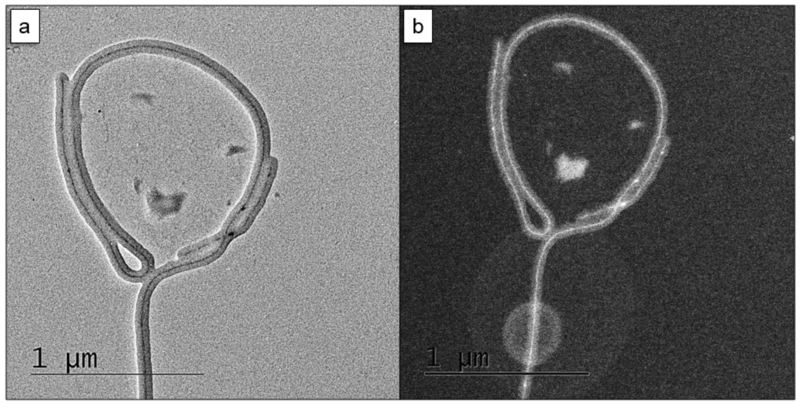 Micelles have been used as templates for the mineralization of inorganic replica before, but multicompartment micelles offer the possibility to create bimetallic nanoparticles with unprecedented shape and composition. For instance, it is conceivable to fill the compartments of a clover multicompartment micelle with different metals / metal oxides given proper compartment chemistry. A solution of perfectly trigonal planar gold satellites sitting on a silver core is investigated for its optical properties. Given our library of multicompartment polymorphs they inspire a range intriguing hybrid nanostructures. Through the self-assembly of properly designed ABC triblock terpolymers, soft polymer-based solution nanostructures can be generated whose surface is decorated with a geometric pattern. In Figure 4 examples of recently developed solution nanostructures are given with unprecedented complexity. Novel solution morphologies of ABC triblock terpolymers as exemplified on spirals-on-discs, double helix-on-cylinders, striped sheets, patchy spheres and striped vesicles (polymersomes). Here, block A forms the inner core or substrate, block B (golden) the topographic pattern and block C the stabilizing corona that has been omitted for clarity. Figure 4. Design principle of a MCNR exemplified on a "clover" MCM. Compartmentalization is a fundamental concept in nature that allows organisms to separately store, convert and transport matter. Self-assembled compartments further allow the site-isolation of catalytic species so that cross-reaction between these catalysts is avoided. In the "organs" of cells (organelles) catalytic cycles are performed with multiple catalysts that would consume each other. However, still it seems to be possible to synthesize organic molecules through multistep one-pot catalysis in water. The solution in nature is to strictly separate these “wolf and lamb” catalysts and store them in compartments or walls of compartments, where they are locally immobilized so that they cannot reach and react with each other. It would be desirable to mimic such a water-soluble multicompartment nanoreactor (MCNR) with self-assembly concepts. Cascade catalysis in one-pot reactors in water would already be very beneficial regarding the lower required amount of solvents and energy. Combined with the very short distances of nanocompartments (and the catalysts) catalytic steps could become very fast with high yields, and even allow some cascades for the first time (e.g. where otherwise fast side reactions become dominant). Another project comprises the modification of individual compartments of multicompartment micelles with catalysts to perform multistep one-pot cascade catalysis in water. We currently design ABC triblock terpolymers for the formation of multicompartment micelles that carry different catalysts selectively stored in each compartment and protected from cross-reactions. Since we have already established the effect of block composition on nanoreactor shape and compartment morphology, we now progress towards equipping blocks with organo-, organometallic and metal nanoparticle catalysts. We will use our hierarchical self-assembly route to produce near monodisperse nanoreactors in order to directly correlate catalyst performance to nanostructure. Cellulose is the one of the most abundant biomaterials on earth and has recently attracted immense attention in form of nanocellulose with numerous visionary works on extraction, modification and application. Nanocellulose can be harvested from various sources including plant waste, and is used for biomedicine, as reinforcement in nanocomposites, and flexible/wearable electronics. Cellulose nanofibers (CNF) have a diameter of 5-30nm (depending on the source) and exhibit several micrometres in length. They have caused a sheer research boom in many fields of natural sciences attributed to their exceptional material properties and their low ecological impact, i.e., they are biocompatible, nontoxic and extracted from renewable resources. Previous works have shown that the nanofibers form high surface area networks with control over pore size through processing strategy with the possibility to carbonize. On the other hand, the nanofibers can also be decorated with inorganic NPs due to their specific surface chemistry, thereby creating e.g. nanofibrillar networks with high surface are and homogeneous distribution of catalytically active NPs. 33. J.-M. Malho*, J. Brand, G. Pecastaings, J. Ruokolainen, A.H. Gröschel, G. Sèbe, E. Garanger*, S. Lecommandoux, “Multifunctional stimuli-responsive cellulose nanocrystals via dual surface modification with genetically engineered elastin-like polypeptides and poly(acrylic acid)”, ACS Macro Lett., 2018, 7, 646-650. 29. Polymer brush guided templating on well-defined rod-like cellulose nanocrystals, M. Morits, V. Hynninen, Nonappa, O. Ikkala, A.H. Gröschel, M. Müllner*, Polym. Chem., 2018, 9, 1650-1657 (invited article). 28. Imaging Inelastic Fracture Processes in Biomimetic Nanocomposites and Nacre by Laser Speckle for Better Toughness, T. Verho, P. Karppinen, A.H. Gröschel, O. Ikkala*, Adv. Sci., 2018, 17, 1700635. 27. Novel materials through assembly of nanocelluloses, E. Kontturi, P. Laaksonen, M. Linder, Nonappa, A.H. Gröschel, O. Rojas, O. Ikkala*, Adv. Mater., 2018, 1703779. 26. Polymer Brushes on Cellulose Nanofibers: Modification, SI-ATRP, and Unexpected Degradation Processes, M. Morits, J.R. McKee, J. Majoinen, J.-M. Malho, N. Houbenov, J. Seitsonen, J. Laine, A.H. Gröschel*, O. Ikkala*, ACS Sustain. Chem. & Eng., 2017, 5, 7642–7650. 24. 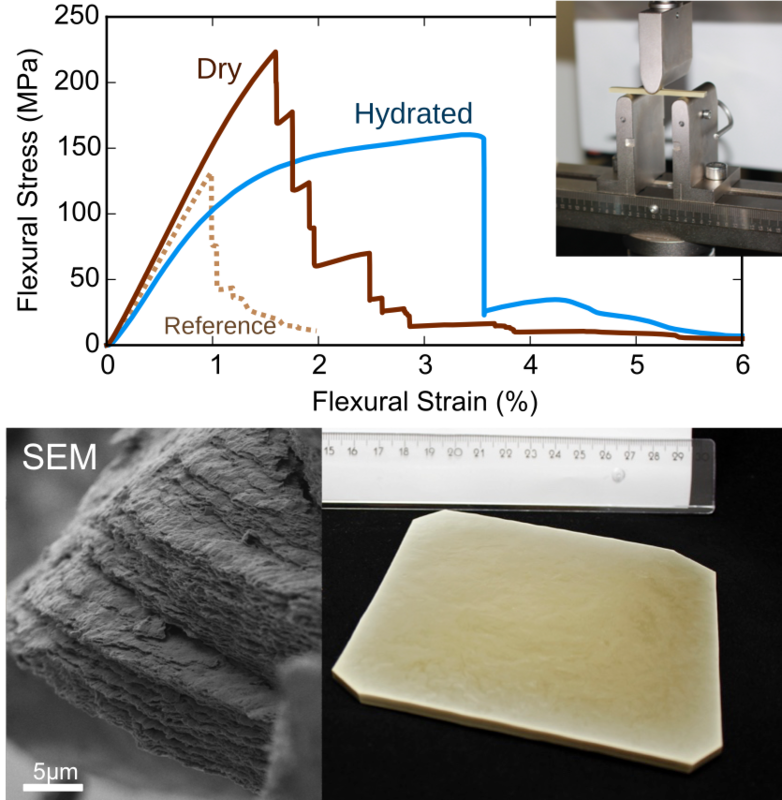 Toughness and Fracture Properties in Nacre-Mimetic Clay/Polymer Nanocomposites, M. Moritz, T. Verho, J. Sorvari, V. Liljestrom, M. Kostiainen, A.H. Gröschel*, O. Ikkala*, Adv. Funct. Mater., 2017, 27, 1605378. 23. Rod-Like Nanoparticles with Striped and Helical Topography, J.-M. Malho, M. Moritz, T.I. Löbling, J. Majoinen, Nonappa, O. Ikkala*, A.H. Gröschel*, ACS Macro Lett., 2016, 5, 1185−1190.